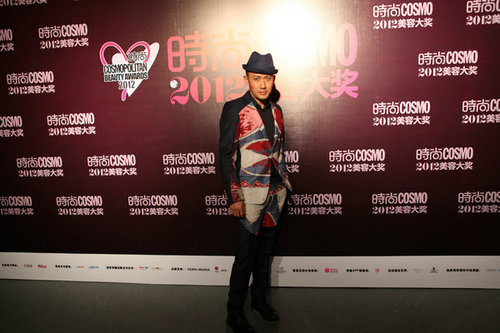 The "cosmo annual Beauty Awards held at the Shanghai Cultural Plaza on November 1. The award, known as the beauty fashion industry "Oscar", so the day of the awards ceremony is the number of stars the biggest names to the scene to help out, Song Seung Hun, Kim Hee Seon, Li Yuchun, Nie Yuan, Ni Ni, Angelababy, Sun Li, more than 40 celebrities and beauty experts to visit scene. That night, Nie dressed in suits and hat of the top Belgian designer Walter Van Beirendonck blue printing stitching red carpet on the night won the the "cosmo annual fashion Male Artist" award.